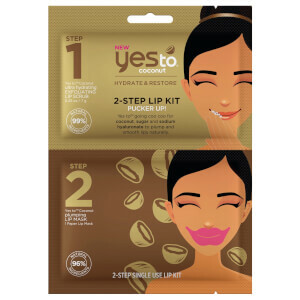 Treat your complexion to the Yes To Triple Masking Kit - Hydrate, Detox, Calm; a face mask trio that work in tandem to deliver multiple benefits to skin. A deeply hydrating formula that doesn’t leave skin feeling greasy. Infused with Coconut Oil and Kaolin Clay for a smooth complexion, the single use face mask balances and purifies skin to leave it with a healthy glow. A rich and creamy formula that draws out impurities and leaves you with skin that shines. Utilising Salicylic Acid and Charcoal, the single use face mask detoxifies skin for a complexion that looks clean and glowing with minimised breakouts. A soothing mixture of Cucumbers and French Green Clay. The single use face mask balances skin and gently removes impurities for a complexion that feels cool and hydrated. Soothes sensitive skin without leaving it dried out or dull. Eine großzügige Menge auf die gereinigte Haut auftragen und 5-10 Minuten lang die beruhigende und pflegende Wirkung genießen. (Wenn du möchtest, kannst du dich solange hinlegen und die Augen schließen.) Mit Wasser abspülen, um den wunderschönen, gepflegten Teint zum Vorschein zu bringen. Hydrating Mud Mask: Water (Aqua), Aloe Barbadensis Leaf Juice, Kaolin, Bentonite, Propanediol, Cocos Nucifera (Coconut) Water, Hamamelis Virginiana (Witch Hazel) Water, Titanium Dioxide (CI 77891), Cetearyl Alcohol, Magnesium Aluminum Silicate, Glyceryl Stearate, Hydrogenated Vegetable Glycerides, Polyglyceryl-10 Oleate, Cocos Nucifera (Coconut) Oil, Cocos Nucifera (Coconut) Fruit Juice, Honey (Mel), Morinda Citrifolia Fruit Extract, Aleurites Moluccana Seed Extract, Hibiscus Sabdari a Flower Extract, Musa Sapientum (Banana) Fruit Extract, Orchis Mascula Flower Extract, Psidium Guajava Fruit Extract, Olea Europaea (Olive) Fruit Oil, Persea Gratissima (Avocado) Oil, Helianthus Annuus (Sunflower) Seed Oil, Sodium Hyaluronate, Hydrolyzed Jojoba Esters, Glycerin, Glyceryl Caprylate, Dipotassium Glycyrrhizate, Xanthan Gum, Tetrasodium Glutamate Diacetate, Ethylhexylglycerin, Citric Acid, Phenoxyethanol, Fragrance (Parfum), Coumarin. Charcoal Mud Mask: Water, Cocos Nucifera (Coconut) Oil, Aloe Barbadensis Leaf Juice, Glyceryl Stearate, Butyrospermum Parkii (Shea) Butter, Glycerin, Zea Mays (Corn) Starch, Propanediol, Behenyl Alcohol, Cetearyl Olivate, Theobroma Cacao (Cocoa) Seed Butter, Octyldodecanol, Sorbitan Olivate, Simmondsia Chinensis (Jojoba) Seed Oil, Charcoal Powder, Solanum Lycopersicum (Tomato) Fruit Extract, Persea Gratissima (Avocado) Oil, Aspalathus Linearis Extract, Citrullus Lanatus (Watermelon) Fruit Extract, Chamomilla Recutita (Matricaria) Extract, Cucurbita Pepo (Pumpkin), Ginkgo Biloba Leaf Extract, Tocopheryl Acetate, Glyceryl Caprylate, Xanthan Gum, SodiumHydroxide, Stearic Acid, Ethylhexylglycerin, Pentaerythrityl Tetraethylhexanoate, Alcohol, Phenoxyethanol, Fragrance, Benzyl Benzoate. Calming Mud Mask: Aloe Barbadensis Leaf Juice, Water (Aqua), Kaolin, Bentonite, Propanediol, Hamamelis Virginiana (Witch Hazel) Water, Cetearyl Alcohol, Magnesium Aluminum Silicate, Titanium Dioxide (CI 77891), Glyceryl Stearate, Hydrogenated Vegetable Glycerides, Polyglyceryl-10 Oleate, Cucumis Sativus (Cucumber) Seed Extract, Cucumis Sativus (Cucumber) Fruit Water, Cucumis Sativus (Cucumber) Seed Oil, Curcuma Longa (Turmeric) Root Extract, Ocimum Basilicum (Basil) Flower/Leaf Extract, Ocimum Sanctum Leaf Extract, Brassica Oleracea Italica (Broccoli) Extract, Chamomilla Recutita (Matricaria) Flower Extract, Peucedanum Graveolens (Dill) Extract, Spinacia Oleracea (Spinach) Leaf Extract, Montmorillonite, Aloe Barbadensis Flower Extract, Solanum Melongena (Eggplant) Fruit Extract, Butyrospermum Parkii (Shea) Butter, Vitis Vinifera (Grape) Seed Oil, Melia Azadirachta Leaf Extract, Melia Azadirachta Flower Extract, Coccinia Indica Fruit Extract, Corallina O cinalis Extract, Hydrolyzed Jojoba Esters, Ricinus Communis (Castor) Seed Oil, Glycerin, Dipotassium Glycyrrhizate, Illite, Xanthan Gum, Glyceryl Caprylate, Tetrasodium Glutamate Diacetate, Ethylhexylglycerin, Citric Acid, Phenoxyethanol, Iron Oxides (CI 77492), Fragrance (Parfum).